The winter sky provides a fantastic opportunity to develop, practice and perfect those emergency survival skills that are based on basic astronomy. One such piece of knowledge worth learning about is how to tell the time using the stars. 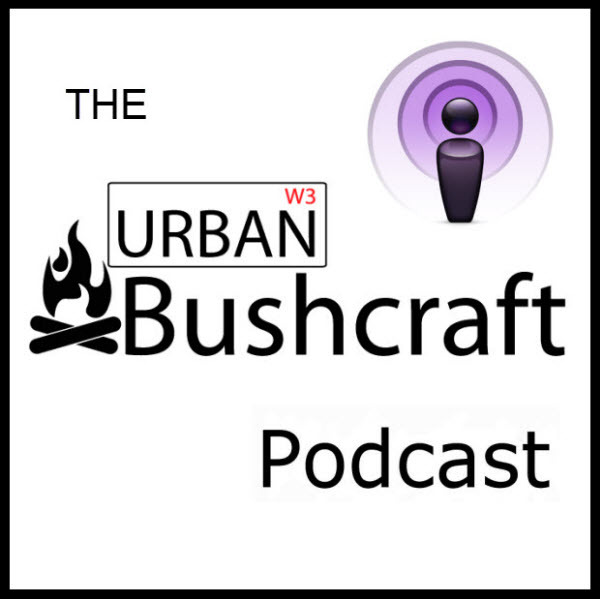 Perhaps not the most urgent of survival skills to possess, it is interesting to learn and great to teach younger bushcrafters! imagine a line running from Merak to Dubhe and then continue that line for roughly five times the distance between the ‘pointers’ until you reach Polaris (see fig 1). By following another imaginary line from Polaris straight down to earth we can identify the direction from us to that point, and beyond, as north. However, these very same stars can be used to help tell the time too! Although most people may have a watch or a mobile phone to accurately determine which time of the day or night it is, it is just as easy for someone to carry a compass or matches or a tent or a camp bed etc to help make a stay in the wilds more comfortable. Yet we as survivalists or bushcrafters want to go beyond that and be able to cope relying on a meld of knowledge, observation and whatever we can find around us. From a scouting perspective, this is a skill that my Senior Scouts have to learn and be tested in as part of achieving the Astronomer badge. To that end, with the benefit of a relatively cloud free sky we can easily tell the time. Unfortunately this is not a requirement in most youth organisations so the technique is becoming a dying art! There are all sorts of weird and wonderful ways to do this. 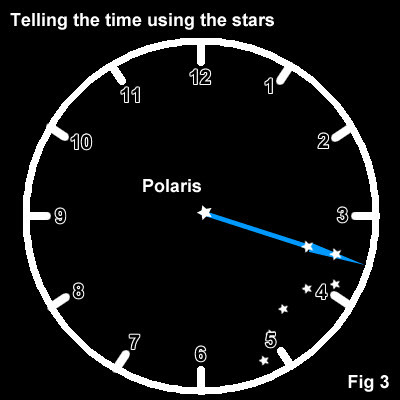 Some methods involve an imaginary 24 hour clock face centred on Polaris but running anticlockwise; another way involves an imaginary straight line running from Megrez, in The Plough, through Polaris and on to Caph in Cassiopeia. Perhaps these methods are easier to get to grips with than others for certain individuals but, in general, the more complex or peculiar a method, the more likely it is that mistakes will be made. Trying to visualise a backwards 24 hour clock face is likely to be more confusing than a 12 hour clock face running clockwise as we have been brought up to accept reading in a clockwise direction when telling the time. Having many, many years experience of instructing in the Army combined with my professional role as a teacher and my voluntary role as Senior Scout Master I find it best to remind myself of the mnemonic KISS (Keep It Simple Stupid) when passing on information and practical skills to others. Learners need to get things clear in their heads to allow them to learn more effectively. Furthermore, not everyone knows the names or positions of the various stars so may have problems locating Megrez or Caph. Having been an instructor for many years in the army and currently working as a school teacher and a scout leader I prefer to use the simplest effective method to help people achieve the learning objective. The method I prefer to use to initially instruct others requires no prior knowledge and no need to identify specific stars in specific constellations. All that is required is that Polaris and The Plough are visible. The first step is to identify Polaris: the Pole Star and imagine that this is the centre of an analogue clock face (see fig 2). 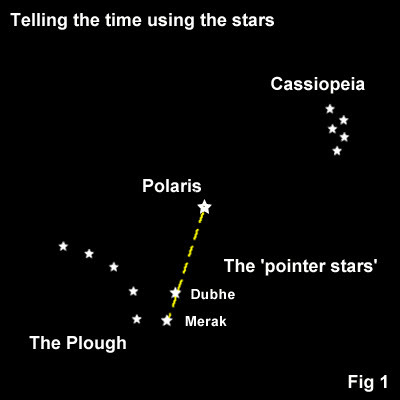 Secondly, use the pointer stars of The Plough as if they were the hour hand of the clock and read off the time (see fig 3). Do not simply read the hour but be as accurate as you can possibly be eg quarter past, half past etc. The more accurate you are the better. To assist accuracy you could draw a clock face on to acetate or a transparent sheet! Using fig 3 as an example the time shows approximately 6.45 which we will convert to the value 6¾. Next we must apply a little bit of basic arithmetic. To do this we must calculate how many months after March 7th it is e.g. on November 7th it would be 8 months after; on December 22nd it would be 9½ months after. Again be accurate, at least to quarters or halves. This value must be added to the ‘time’ you read using the pointer stars. For example, if the time you read was 6.45 (ie 6¾) and the date is November 20th (approximately 8½ months after March 7th) you would add these two values together i.e. 6¾. + 8½ = 15¼. At this point we double the number, so in this example 15¼ would become 30½. Now this is fine if we are on Greenwich Mean Time (or any country’s time zone equivalent) but if we are using British Summer Time (or daylight saving) we must add 1 to our number to take that extra hour in to account. Since, as I write, GMT ensures that the dark nights are drawing in incredibly early I do not need to add anything on. But do not forget the point: add an hour on if it’s BST. The final thing to do is to deduct the number we have calculated from 24 (or 48 if the calculated number is over 24). In this case we cannot deduct 30½ from 24 so we instead deduct from 48: 48 – 30½ = 17½ and 17½ in the 24 hour clock system is 5.30pm. We now have the theory but as many educational experts such as Kolb and Piaget – not that most of us need their expertise to confirm what we already know – have said that we learn most by doing. In other words: it would be most helpful, if to adorn one’s mind with the knowledge and expertise to enable one to deduce the time to a somewhat reliable level of accuracy, get the ‘dirt time’ in! This entry was posted in Navigation, Scouts. Bookmark the permalink.